Awesome video review for 'The Morphant'! Ten million thanks to Ethan (11) for giving the book such a fabulous review. Thanks, Ethan! One of "The Morphant"'s best reviews ever! The nicest review ever for 'The Morphant'?! Big thanks to Maureen Gallagher, all the staff and 70 or so pupils at Salisbury Rd, London NW6. You were a lot of fun! 'The Morphant' author Cornelius Fuel, reading from Dr Seuss' Green Eggs & Ham, Tetbury Library, Saturday June 16th at 11am. For 3-8's and their mums and dads. Great ideas for new storylines from some 9-12s! After a recent school reading I asked the pupils: 'My hero Gabriel can change into very cool characters. What characters would YOU like to change into?' And after describing the new plot for "The Morphant 2", they were asked to dream up their own plot lines. The responses were amazing ...! Fabulous feedback for a school reading from 'The Morphant'! Thanks to all the pupils at Farrington's School for their fantastic response! Super feedback and ideas from everyone based on the first Morphant story, and on the follow up story which is still being written! Thank you, Farrington's School, Chislehurst! Another nice review on Amazon! Thanks to another reader for giving the book 5-stars! A lovely welcome from everyone at Laxton Junior School today! A very big thank you to Andrea Fryatt, Helen Shair and all the other teachers and pupils at Laxton School in Oundle for their fantastic friendliness, organisation and enthusiasm at my reading today from 'The Morphant'. I really enjoyed meeting everyone and signing copies of the book. And I hope to be back in beautiful Oundle again before too long! Cornelius is making a personal appearance at this super school in Oundle, Northamptonshire to read some of the most exciting bits from his adventure story 'The Morphant'. He's thrilled to be invited! (signed) Miss Otter, personal assistant to Cornelius Fuel. A very nice review for The Morphant! Cornelius Fuel is very excited to announce a pre-Christmas reading from 'The Morphant' to 70 children at Laxton Junior School in Northamptonshire. 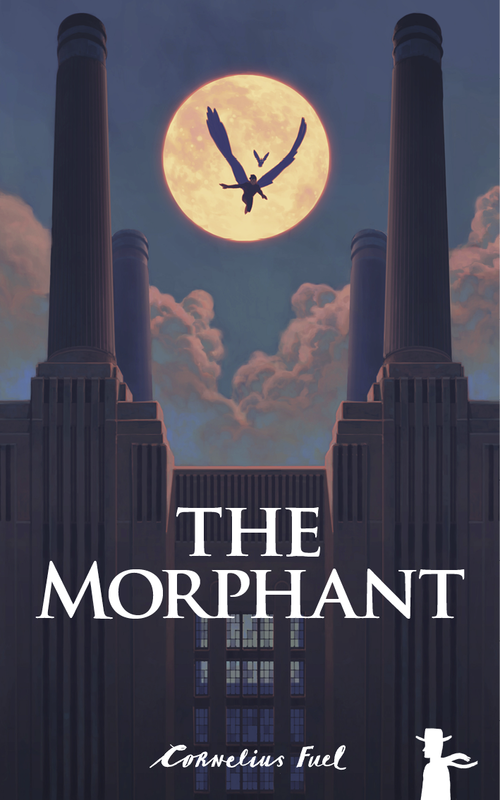 Already a 5-star reviewed e-book (and audiobook) 'The Morphant' is published in paperback by Matador Fiction 28/09/17. Cornelius' Amazon author page goes live! One of my most influential books as a children's author. Herge and his studio created a vast collection of absolutely corking adventure stories, all told in Herge's amazingly filmic storyboard style, all with that must-turn-the-page NOW!! pacing, all with fantastic characters, great baddies, thrilling plots and bundles of laughs (and with superb English translations). But Tintin In Tibet somehow manages to cram the whole caboodle into one tight, taut, emotional, brilliantly drawn, book. You really will laugh. You really will cry. (Well, I did). Lovely review from a generous blogger! First free extract from 'The Morphant' audiobook! Check out this YouTube extract from 'The Morphant'.